As you might recall, we spent last weekend at the Jersey Shore (South Jersey Shore – not like the television show!) and it was awesome. 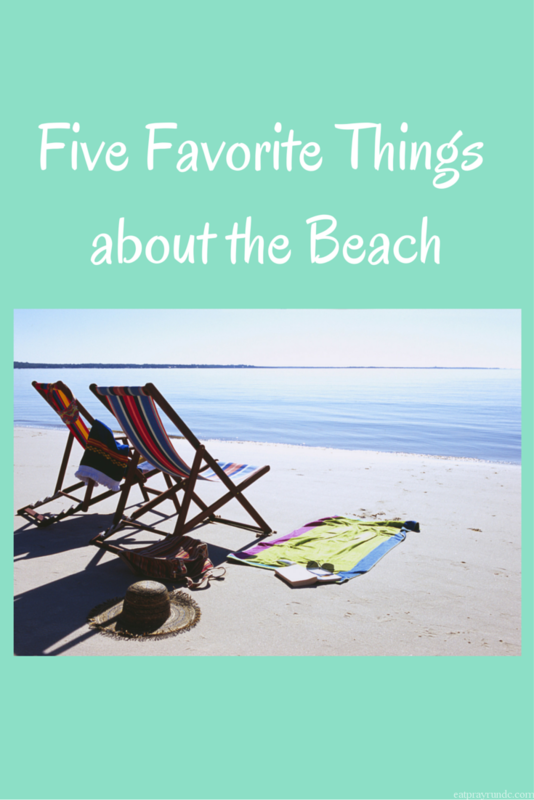 Since this week, the Friday Five is focusing on favorites, I thought I’d talk about my five favorite things about the beach. I could easily have a list of about 20 things because the beach is awesome. But I’m a rule follower, so I’m just listing five. I wish I was going to the beach this weekend. It’s hot as the devil and while that’s perfect beach weather, in the city it is not so awesome. But I’m crossing my fingers I’ll survive all my weekend running anyway! 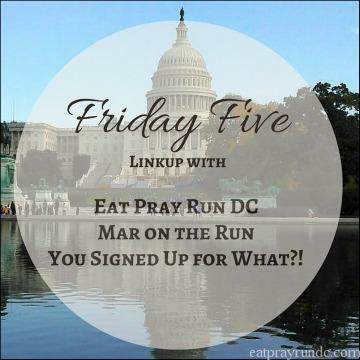 Don’t forget to check out Cynthia and Mar and some of the other folks who link up with us – and please don’t forget to link to your hosts if you are participating! Relaxation. There are few things more relaxing then time spent at the beach. It’s fun, it feels like summer and it’s just relaxing and soul soothing. Honestly, after the events of last week, I really needed something calming and soul soothing and the beach was it! Ice Cream! The beach brings LOTS of options for ice cream and other yummy treats. Somehow it just always tastes even better at the beach, right? The water. I love swimming, I love the ocean and I especially love being able to get in the water after a run, which I was able to do last weekend. Boardwalks. What’s a beach without a boardwalk, right? Well, not actually because there are plenty of beaches I have loved that don’t have boardwalks (ahem, honeymoon, ahem). But I do love a good boardwalk. What’s your favorite thing about the beach? I’m not a beach girl. I don’t like the sand and I hate being hot. I’m that person who escapes north to the mountains every chance I get in the summer. I enjoy the mountains as well – I like outdoors overall, I think! It’s funny because I live in NJ and people assume that everyone in NJ is like the Jersey shore when in fact no one goes to that beach they were at. I’m glad you had fun at the beach. I enjoy going myself but I don’t like to go every weekend. Yes – I always have to qualify when I say Jersey. South Jersey and North Jersey are too completely different places! I love the beach! I get to go once a year if I’m lucky….it’s just so relaxing and peaceful. Glad you had a fun time! I really need to squeeze a day down the Jersey Shore before the summer ends! Janelle @ Run With No Regrets recently posted…5 Favorite Things About Being a Blogger + Giveaway! I’ve had several beach days this summer and plan to have a few more coming up. I just wish more of them allowed dogs. Apparently they don’t know how well behaved my labradors are…lol. We’re leaving the beach today and I’m so sad! Only 5 things? I’d have trouble narrowing my love for the beach down to 5, altho you picked some of my favorites. I pretty much love the water. It’s where I feel at peace and so relaxed. I may not be going to a beach, but I have a BBQ and slip n slide party tomorrow. I haven’t been on a slip n slide in years. This post is perfect timing, because I’m leaving for South Beach tomorrow! I totally agree, there is something so relaxing about laying on a beach. Beaches just define summer to me! I love hearing the sound of the waves, it’s so calming to me. Good luck with your run this weekend! And the sounds of crashing waves! My favorite is taking a long walk and then jumping in the water. My favorite thing about (east coast US) beaches would be the sunrise! I’m not a morning person, but seeing a sun rise over the ocean and hearing the waves… so incredibly peaceful! I love the beach at the end of the day, when people are going home, it is cooling off and it is not as hot. I also love to people watch. I don’t know what it is about the beach but there is something magical about it! Maybe the smell of the saltwater and the boards of the boardwalk?? I love the beach… something about the smell of the salt air and sunscreen just makes me happy! If I could live at the beach I would. Its so calm and peaceful, and I agree, there’s nothing like relaxing on the beach with a good book or magazine in hand. Riding bikes and just enjoying the sea water smell. We’re lucky to live 30min from the beach and we can spend an entire afternoon there! My ideal beach day is basking in the sun while reading a book and the kids are playing in the sand. Of course, the ideal day doesn’t happen too often since the girls are still young, so they need attention. I also like to look for interesting seashells and sand dollars. I’m not a big beach person, but I like it for a few days. An afternoon of laying out, morning/evening walks in the sand, listening to the waves… I’ll reread this next month before I head to the beach! There is something so relaxing about being able to just jump in the ocean after a run! I hope you had a great vacay!